We choose this resort as we wanted somewhere quiet. This is exacly what we got.. lovely little place with 2 beaches - one was tiny but lovely and then you go over some wooden steps to get to the other side where there is a much bigger and less busy beach. Fornells is in the north and beach here is a bit more rustic but certainly does not smell like sewerage which someone said in a former review! Definatley worthwhile to rent a car as fornells is tiny so not much else to do except stay at poolside or go to fornells beach and we wanted to explore the island. Other beaches on island which are worth visiting by car are Cala Mitjana and Cala Macarella (have to walk to this one for 40mins over mountain) but definatley worthwhile even with 2 small kids as it is SO SO beautiful in little coves. The location is very pretty and unspoiled with lovely views and is very quiet. More suited to older people and families with very young children as older children could be bored in the evening. There are only a few restaurants but they are all of a high standard with exceptional service and good food try the Reclau on the sea front the views are worth it alone even if you only go for an afternoon drink and the food is amazing. (Ask for directions as it is quite hidden away from the main resort area). The whole area of Cala Tirant is spotless and the small cove and beach is perfect for children as the sea is very shallow and the beach has a lifeguard hut with manned lifeguards at all times. Some reports I have read are appalling and do not in any way reflect what the resort is truly like. I cant believe the people who wrote the bad reports visited the same place. I was going to change my holiday after reading some of the bad reviews I'm so so glad I didn't I thought the place was perfect and would definitely go again. Cars are cheap to hire and because the island is so small it is very easy to get around if you want to get out and about. Also the bus runs to Son Park another pretty resort and also into Mahon which is well worth a visit. Its the second time in Menorca for me and is one of the places I will return to again and again I just love it. The resort is in a very picturesque location but no where did I find reports that prepared us for how isolated it was. one cash point which was out of order all week and the only bar open was at the hotel. Thank goodness for El Cactus restaurant which served excellent food. Buses do run from the resort but only three a day to Mahon and two a day to neighbouring resorts. The beach area was dirty and the sea full of sea weed which made it unpleasant. The resort was really quiet with only 3 restaurants and 1 bar. There was no entertainment at all in this resort. The beach was filthy. The bus service to take you out of the resort is very reliable if you feel you need to escape. Having visited MENORCA 4 times before we new that we wanted to stay near fornells, if you want to visit the rest of the island from these appartments you really need a car for the duration of the holiday. The only other downside to visiting in mid August is that the island is very busy and some of the more remote beaches are full by mid morning if you dont have to travel in school holidays dont! Fornells is very picturesque resort, which sits on the cove like a Moorish enclave. There are some stunning villas around the coast and we took some excellent pictures-You can see why they call Fornells the "Millionaires Playground"
That said there is very little nightlife. I probably wouldn't come back to Fornells, preferring Cala'n Bosch, as it is livelier resort. The resort around the hotel was very quiet and the beach was tiny and very dirty, none of us like the beach so this did not cause a problem. I stayed in Fornells a small quiet fishing village, it is kept very clean, no problems on cleanliness, There are a number of resturants to visit in different price bands. didn't use the beach but it looked nice enough. would i visit this resort again,oh yes everytime,i have booked for sept and for jun 06, for a peaceful stressful break this is the place to be. You would need to hire a car if out a fornells but the driving is ok the roads are not to busy. 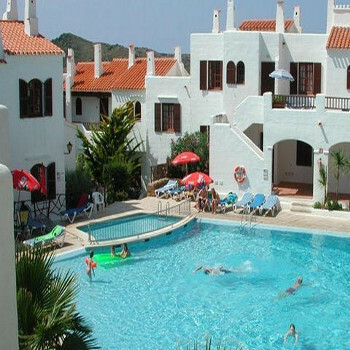 We have been to Playa de Fornells before and have always enjoyed our stays. It is not a resort for night life, but there are a couple of decent restaurants. The beach is small, but well kept. My only experience of entertainment in the resort was at the apartment complex we stayed in-see above. Playa de Tirant is an attractive little resort with two large restaurants Cafe Del Nord and Thai Country, both serve excellent food at what I would call UK prices. There are 3 supermarkets plus 3/4 gift shops and everyone is out to help. The beach is never crowded, there is a lifeguard on site - needed as sometimes the waves can overpower a small child if taken unawares. Beware the sand - it sticks everywhere.. I had ridiculous amounts of sand in my costume and so did my children - even with the power-shower in our room it didn't want to budge...!